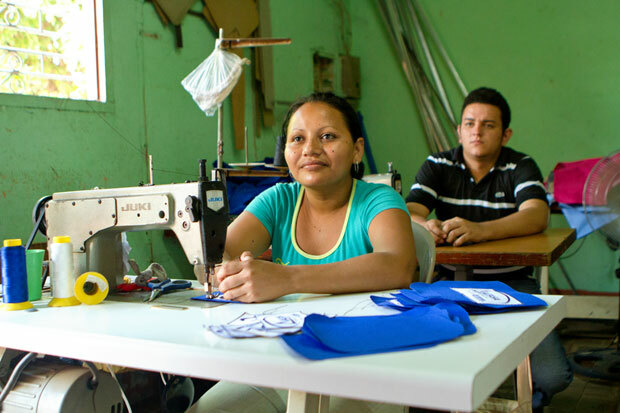 A textile manufacturer is one of 70 enterprises in Nicaragua selected for TechnoServe's new business accelerator program. Bertha Flores used to commute to an all-night shift at a clothing factory one and a half hours away. Now the single mother of three works just a couple of blocks from her home at IKO Imagen, where she enjoys a steady income, a regular schedule and child care benefits. IKO Imagen, a textile and handbag manufacturer, was able to hire Bertha and four other employees during an initial expansion phase, thanks in part to support and training that the business received through a TechnoServe business plan competition in 2010. Now primed for its next phase of growth, IKO Imagen was recently selected as one of 70 small and growing businesses in Nicaragua to receive support and mentoring through Impulsa Tu Empresa (“Boost Your Business”), TechnoServe’s new business accelerator program, implemented with support from the Argidius Foundation. IKO’s co-founders, Verónica Bucardo and Julio Baltodano, attended the program’s kickoff business summit on March 19, where representatives from winning enterprises participated in a signing ceremony and a financial training session. The event also gave entrepreneurs the opportunity to network with mentors, local business leaders and executives from BANPRO, one of Nicaragua’s largest banks. Over the next ten months, Verónica and Julio will work with an Impulsa Tu Empresa mentor to secure new financing, diversify their products and penetrate new markets, such as Panama. By charting a sustainable path to expansion, IKO Imagen can create new job opportunities in Bertha’s community. Learn more about our work with IKO Imagen and the Impulsa Tu Empresa program.